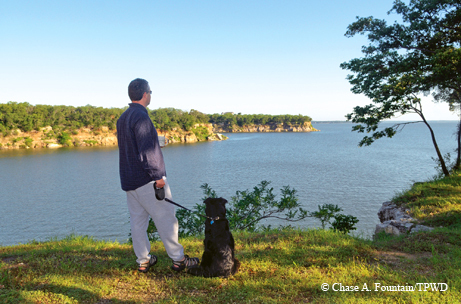 ﻿Bird watching and fishing are among the pleasures at Lake Texoma. ﻿When Capt. Woodrow Call and his motley cowboy crew reached the Red River, they feared for their lives; the river’s quicksand was known for drowning cowboys and horses. Call and his cowhands — characters in Larry McMurtry’s beloved novel Lonesome Dove — had embarked on a cattle drive from Texas to Montana, and the Red was one of their major obstacles. The story captured a lifestyle that has passed into history, but not without leaving a legacy. Before barbed wire came into wide use, cattlemen prized nimble horses that could stop on a dime and turn quickly. Decades later, these precise moves coalesced into a sport called reining, a Western discipline accepted by the international equestrian sports governing body. The “quicksand” that the cowboys once feared is actually the Red River Valley’s sandy loam soil, pure gold for horse trainers since it provides a gentle ride. “The soil drives the horse economy here,” says Lisa Maberry, a competitive reining rider who breeds champions on her 165-acre ranch near Whitesboro, an hour north of Dallas and just miles from Lake Texoma — the impounded Red River. “The sandy loam is good for their joints.” After my boyfriend Doug and I arrive, Lisa introduces me to her quarterhorses, dogs and reining ranch. Whitesboro and the surrounding area has become known as the reining “world headquarters,” with hundreds of equine breeding facilities and the highest density of top reining trainers in the world. Lisa and her husband, Mike, opened the Rancho Sereno Inn at Sandy Creek here in 2007. The upscale B&B is popular among horse buyers, but is perfect for anyone with discriminating taste. The Maberrys designed the cabins using Texas vernacular architecture with farmhouse materials: metal, timber, burnished concrete and stone. Eye-catching horse images adorn the walls, taken on their ranch by renowned photographer Tony Stromberg. And just a few feet outside the cabin door is a nature trail meandering by the creek and through the property. “This region is the undiscovered playground of Dallas,” says Mike. “Six million people live 70 miles south.” The Maberrys love this area at the intersection of the cross timbers and blackland prairie. Less than 1 percent of the nation’s tallgrass prairie remains, but a few nearby nature reserves are trying to change that — including the 11,320-acre Hagerman National Wildlife Refuge, just miles away. When the Corps of Engineers built Denison dam to form Lake Texoma in the 1940s, it drowned the town of Hagerman. As we talk, Mike raves about the refuge. “That refuge is a wonderful amenity to the state of Texas. It’s on the Central Flyway, and nearly 350 bird species come through there.” Mike laments that few people know the refuge exists. After a great night’s sleep, we head to Denison, birthplace of the 34th U.S. president, Dwight D. “Ike” Eisenhower. A white picket fence surrounds the simple home, now a museum called the Eisenhower Birthplace State Historic Site. The entire town is rich with history, including the Red River Railroad Museum. It’s closed today, so we grab lunch at T-Bone’s, situated right at the old Katy Railroad Depot. It’s a bit of a dive, popular with locals. The MKT or Missouri-Kansas-Texas Railroad Co. was the first to enter the state from the north. Living history interests me, but my heart belongs to the great outdoors. After lunch, we head to Eisenhower State Park on Lake Texoma. 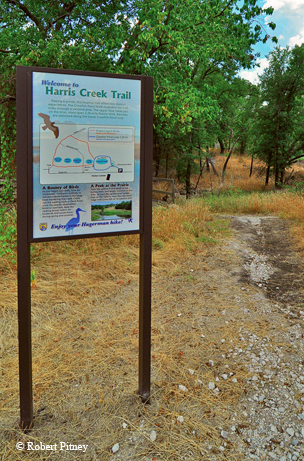 At the park manager’s recommendation, we explore the area near campsite 179, where steep limestone bluffs overlook the reservoir. A short hike takes us down to a sandy beach, and I imagine laughing children playing on the shoreline during warmer months. We clamber on giant boulders until we find a perch to gaze peacefully out over the lake. Despite the winter chill, I wish we’d planned to camp, and make a mental note to return. Instead, we are staying overnight at the Tanglewood Resort, with its own colorful history. After opening in 1957, Tanglewood became the hot spot for family getaways and business meetings, with golf, swimming and outdoor activities. The resort includes time-share condos, traditional rooms and the tower suites where we stayed — rooms encompassing the entire floor of an eight-story, five-sided tower, a Coast Guard navigation beacon. Glass walls surround us in the tower room, and we watch the sunset over the marina below before grabbing dinner at Barnacles, the restaurant downstairs. The next morning we arise early to go bird watching at Hagerman NWR, located on the Big Mineral Arm of Lake Texoma. The austere winter-gray sky contrasts with the earth-yellow grass, dried out and awaiting spring rains. Refuge manager Kathy Whaley shows us around. I noticed oil pump jacks — “grasshoppers” — lining the roadside, and Whaley explains that some people think the refuge is selling out to oil and gas, but that’s far from the truth. “The U.S. Fish and Wildlife Service doesn’t own the mineral rights to the land, so they have the legal right to extract the oil,” she explains. 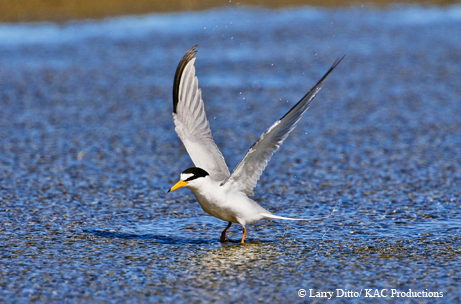 Every summer, endangered least terns nest near the oil extraction. Thanks to the federal Conservation and Reinvestment Act, the refuge will soon have a new building with interpretive exhibits. The building will overlook a planted wheat field that attracts tens of thousands of snow and Ross’s geese in wintertime. The refuge’s old building was in such bad shape that it was condemned. We take the auto tour route, and Whaley points out a wetland restoration project. We drive to an ancient Cedar of Lebanon, an evergreen tree with Biblical significance native to the Medi­ter­ranean. Fortunately, it’s not invasive and the species hasn’t spread beyond this single ornamental, marked with a placard on Hagerman Road. Next, we drive to Haller’s Haven nature trail and take a stroll through the winter woods near Dead Woman’s Pond. “Grayson County is the only place in Texas where deer hunting is archery-only,” Whaley tells us. It’s quite popular, and the refuge receives 850 applications for only 225 permits. A couple of years ago, a proposal arose to change this, but residents insisted that it be kept as it is. Next, it’s time to catch the striped bass Lake Texoma is famous for. Stripers are anadromous, meaning they live in the ocean but breed in rivers — similar to salmon — which made it all the more surprising when the species, stocked here in 1965, decided to breed in the landlocked reservoir. It’s the only lake in Texas where they breed on their own, and the daily catch limit is 10 rather than five elsewhere. We meet up with Striper Express guide Chris Carey at Highport Marina, ideally situated near Tanglewood. His father, Bill, started the company in the 1980s, and they take folks fishing year-round. Although it’s afternoon when we leave, it’s cold, with gray skies and drizzle; cruising at high speed in a motorboat makes it feel even colder. And apparently, we are the only ones to brave the weather. I bundle up in gloves, hat and jacket, as Carey heads west to 1,000-Pound Point, named because so much lead gets dropped here every year. At this time of year, Carey recommends using plastics on lead-headed jigs as bait, and before long, they work like magic. After catching several 2- to 3-pounders, we catch the mother lode. I’d like to say I caught the big one, but Carey hooks the fighter and hands the pole to me. His eyes widen. Once it’s on board, he weighs it: a whopping 11 pounds and 30 inches. Satisfied and chilled, we head back to the marina, stopping to watch a majestic bald eagle near the Oklahoma border along the way. Carey kindly fillets our catch for us, and we hightail it to Tanglewood’s Tran­quility Spa for an hourlong couples massage. Owner Hanna Brinker creates her own luscious lotions and scented soaps, and I select the bergamot and mandarin for my massage. Afterward, we rehydrate with lemon water while enjoying the dry sauna and whirlpool in the private relaxation room. Before our trip to Lake Texoma ends, we dine at De Happy Cajun Restaurant, recommended by Carey, also just down the road from Tanglewood. A massive serving of fried fish and hush puppies is the perfect ending to a visit to an area marked by cowboy history, equestrian sports and world-class fishing. Larry McMurtry once wrote, “Only a rank degenerate would drive 1,500 miles across Texas without eating a chicken-fried steak.” I’d venture to say the same about a flaky-white striped bass.